Life coaching empowers people to make lasting, positive, inspirational change in their working life and life outside work. As such, coaching is a proven highly successful management technique. Many people seek coaches from within their organisation or visit a professional life coach. But many more still feel uncomfortable asking another person to fulfil this role, or don't have access to the right kind of person, with the right kind of time, or simply don't have the disposable income to employ a professional. Imagine the cost effectiveness and convenience of having your life coach on tap 24/7. There whenever you need them. You can - it's you. Based on scientifically validated and tested psychological techniques, this highly practical book will teach you how to make lasting positive, inspirational change in your life. It will help you to identify goals and to reach them. You will learn how to be your own, solution-focussed life coach. BYO - can you be your own life coach? - Coaching is still growing in availability and recognition - people who don't have access to a coach or can't afford one are eager to find ways of benefitting from the ideas. - The large format £15 first edition was the bestselling of all momentum titles by a significant margin - this new smaller format, lower price edition will take it to a much bigger audience. - The smaller format new edition Change Activist has sold really well. - Coach Yourself has the advantage of being written by an academic coaching psychologist - it's not fluff, it's scientfically proven. 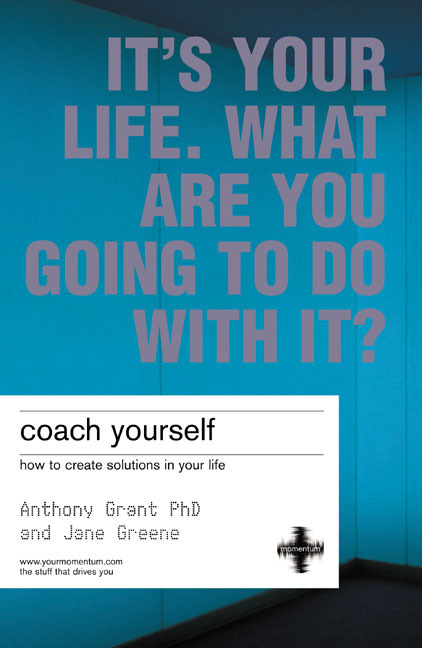 Anthony M Grant is a Coaching Psychologist, based in New South Wales, Australia. He holds a BA(Hons) in psychology from the University of Sydney and a Masters of Behavioural Science from Macquarie University, Sydney. He is currently completing a PhD in enhancing performance and well-being using evidenced based cognitive behavioural coaching techniques. His research and practice has frequently been reported in the media and he has a number of publications in the academic press. He has presented papers and workshops at national and international conferences. He has received a number of awards for his work in psychology including the Australian Psychological Society Prize for Psychology (1997) and the University of Sydney Medal for Psychology. Tony established the world's first university-based Coaching Psychology Unit at the Department of Psychology in the University of Sydney, where he teaches and co-ordinates the world's only university-based post-graduate degree program in Coaching Psychology. He has a private coaching and consulting practice and runs group-based seminars and coach training programs for industry and community organisations.